OSWEGO, NY – Members of Cub Scout Pack 888 from Oswego recently toured the Oswego County Legislature Chambers. They met with Legislature Chairman Kevin Gardner and Clerk of the Legislature Wendy Falls. The scouts learned about local laws and the role of the legislature. First row, from left, are Ethan Cliff and Dominick Vosseller, Wolf den; Armando Vosseller, Tiger den, Jose Vosseller, Lion den; and Mitchell Treasure, Tiger den. 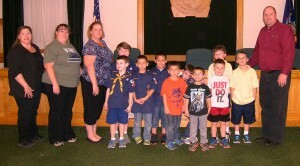 Back row, from left, are Melissa Treasure, Lion and Tiger den leader; Jessica Vosseller, Wolf assistant den leader; Betty Dunsmoor, Wolf den leader; Wolf den members Dylan Klefbeck, Gian Criollo-Rivera, Rowan Goldberg, Keegan Finch, and John Martin; and Legislature Chairman Gardner.